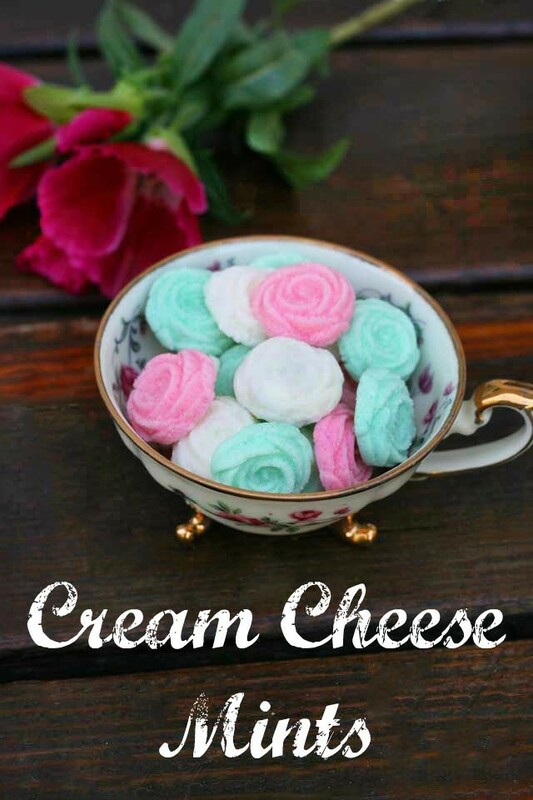 These homemade cream cheese mints make me feel just a wee bit nostalgic for the 80’s. You see, I remember these when I was growing up. They would be served at graduation parties, weddings, and other celebrations. As a little girl with no self-control, I would eat these by the handful. I hadn’t eaten these for – well, decades – until I went home to visit my parents a few weeks ago. My mom and I made a batch, bringing some to Ladies Aid, giving some away to some friends, and eating some ourselves. They tasted just as good as I remember. This recipe makes a boatload of mints. Although I didn’t count, I think I ended up with roughly 120. That’s about two cents per mint. Feel free to half the recipe if you don’t need such a large quantity. Do Cream Cheese Mints Freeze Well? Yes. One of the best things about these cream cheese mints is that they freeze very well. You can make a batch of mints up to a month ahead of time, and they will be ready to go when you need them for your party. Just remember to seal them very well so no air gets in. I recommend double bagging them and placing the bags in a plastic container. Take the frozen mints out of the freezer 30 minutes before you plan on eating them. For a classic mint taste, use peppermint flavoring. You can also use almond, vanilla, or another flavor. Start with just a drop or two of flavoring and go from there. Place cream cheese in a large mixing bowl. Using an electric mixer, start adding powdered sugar until you reach the consistency of play dough. This will probably be slightly less than a 2-pound bag of powdered sugar. If the dough is sticky at all, keep adding powdered sugar. Add a drop or two of flavoring and mix to incorporate. Add more flavoring if desired. Place equal portions of the dough into separate bowls. Add desired food coloring and mix well. To make mints, take a marble-sized portion of dough, roll it in granulated sugar, and press into a mint mold. Remove mint by inverting the mint mold. The mint should pop right out. Repeat with remaining dough. Store in fridge until ready to serve. Classic recipes like this never go out of style. Thanks for reminding me about this great little treat. Another great one Haley! I take it you had them in Texas/Colorado too? Just wondering if light cream cheese can be used?? Also can they still be packaged as gifts once defrosted?? If you make these ahead of time and freeze, what is the best storage method? I would place them in a large Ziploc bag in a single layer, then remove as much of the air as possible. Or you could place them in a Tupperware container, separating each layer with parchment paper. Could you use a cookie press with this recipe? Although I’ve never tried, I do not think that a cookie press would work for this. I don’t think the dough is hard enough? But I could be wrong. Definitely let me know if you try it and it works. I will be making this recipe for my Grand daughter’s wedding We will be putting them at each table for the guest. It is pretty and it looks like something that would be very yummy for the quest. I am looking for other ideas to add to it. I will need to make ahead because the wedding is in May and will be outside. 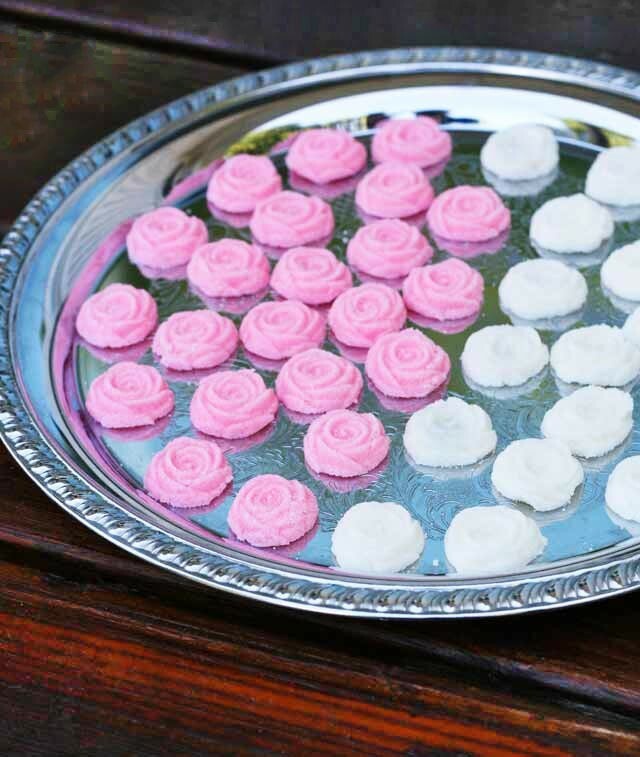 These mints can be made ahead of time, so you can avoid some last-minute stress before the wedding. Good luck! If you freeze these how long does it take to defrost and do you defrost on the counter or in the fridge? Once set out for guests how long can the maintained at room temp before getting too soft? Plan to use for a grad open house that is several hours long. These mints can be eaten frozen – they don’t get that hard. However, I would take them out of the freezer 30 minutes before you plan on serving them. Also, they don’t melt and get too soft (unless you live somewhere really hot!) so don’t worry about that. Good luck! Send me a photo if you end up making them – I’d love to see them! How long do these stay good in the refrigerator? I want to make them for graduation and was wondering if they would stay fresh for a week? They would probably be fine wrapped tightly and stored in the fridge. But just to be sure, I would put them in the freezer. I am thinking about making these for my sister’s bridal shower. I want to wrap a few for each guest. Do you think a small bag would be okay? Or perhaps a small jar of some sort? My main concern is how soft they will get at room temperature. I think they should be fine. They’re quite firm. If you’re worried, just keep them in the fridge until you pass them out to guests. Do you have to dip them in granulated sugar? I doubt it would work. This has the consistency of Play-Doh, so I can’t imagine squeezing it out of a decorator bag. If you try it, let me know! I made these with the cookie press and they came out absolutely beautiful! How long do they need to set or dry before you put in refrigerator? You can refrigerate them right away. Hi Cheryl. I would add a bit more powdered sugar and mix it up again. Then, before placing in the mold, roll the ball in granulated sugar. This should help! Can u roll out and use a small cookie cutter if u don’t have molds? Yes, you can. I would recommend using a very small cookie cutter. Would this recipe work in a sucker mold? I don’t mean like a round lollipop mold. The one I am wanting to use is a shallow baby onesie that you can insert sucker sticks into. Also I am wanting to split one batch up into three so that I can add three different flavors. Do you think one drop of flavoring for each part would be too intense? Hi Kasie – The dough turns out to be the consistency of Play-Doh. I don’t know exactly what your mold is like so I can’t give you an exact answer, but just try to visualize whether or not you could do it using Play-Doh. This may sound silly, but could you use silicone molds for these? I had pink and white roses and green leaves at my graduation party in the early 80s. It’s a lost treat that should come back, unlike lime jello with pineapple and cottage cheese. Yep, I’m Minnesotan. I think so, Janet. If you could remove Play-Doh from a silicon mold, then you’d be able to remove these mints from a silicon mold. Can you use wax paper instead of parchment paper? What kind of molds do you use or think work best? Rubber mint molds. See recommendations above. With the large sheets of rubber molds, do you cut them apart into individual molds or leave the sheet intact? I would break them apart. If so, what do you use for chocolate and how much? I’ve never tried it. It sounds interesting – let me know if you give it a try. I am making them and bagging 4 to a bag on Sept 5th for a Sept 16th wedding. Will they be okay? Yep! Just pop them in the freezer. I’m going to be making mints for my son’s wedding in January. Will they be ok to freeze that long? Second, can colored sugar be used in place of the granulated white sugar? I think they could be kept frozen that long. Just be sure to seal them VERY well (like triple bagged and put in a plastic container). Also, yes, you can use granulated colored sugar instead of granulated white sugar. I just made a double batch of these…..I have never made anything so frustrating. 1st…..I had the wrong kind of molds, they were chocolate molds and the mints would not “pop” out. I tried the cookie press, no go there either. So, I rolled them in marble size balls, put them between 2 sheets of wax paper and pressed them flat with a small glass. Not exactly what I wanted for my mother-in-laws 90th birthday next weekend but oh well. LOL The consistency of the mints was great, reminded me a lot of playing with play dough as a kid. I am hoping the will harden as they sit as they are pretty soft right now. I hope they’re a hit! I would like to pipe these. Do you think heating the mixture a bit would soften it enough to do that? I’d love to make them for the holidays, but I don’t have money to buy molds. I do have a bunch of nice piping tips, though. Try adding some extra flavoring, such as vanilla, almond or peppermint. Well so far they taste great but they do not work as a stand alone candy they are too mushy and I wanted them for Christmas candy boxes but they don’t have a consistency that will keep if you put them out. There has to be a better or different way to make them so you can not refrigerate all the time. Hi Lorraine – Since these are made from cream cheese, they should be refrigerated most of the time. You could try adding a bit more powdered sugar to make them more sturdy. Another Christmas where the weather is hot and humid spoiling my plans for making salted caramel and cooked fudge! My husband and I love working in the kitchen together and when we came across this recipe, nostalgia washed over us. But, alas, the hot, humid southeast Louisiana weather this Christmas baking and cooking season made this recipe a disaster. So disappointed as we were looking forward to these! Oh no! So sorry to hear that. I hope you’ll give them a try when it’s not so hot & humid out. They really are super tasty! 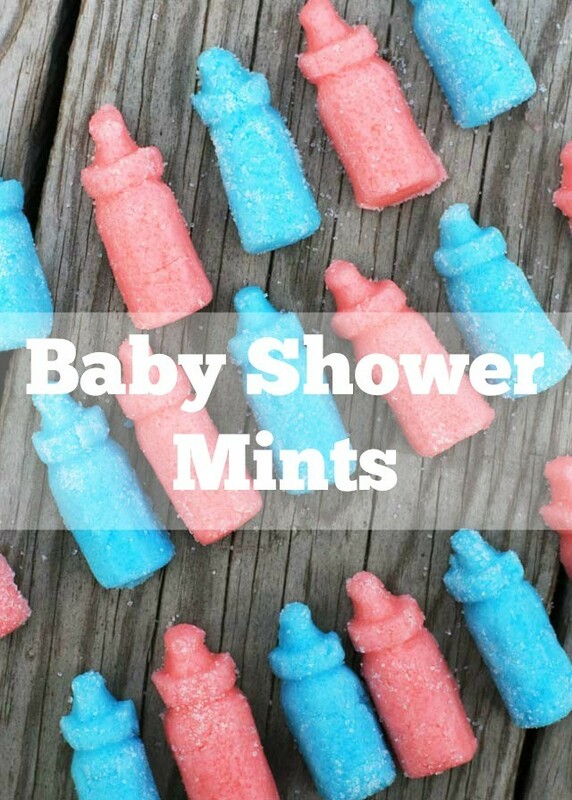 I am planning to make these for a baby shower and have a “fondant mold” of little baby feet. Will a silicone fondant mold be as easy to remove the mint as true “mint molds”? Or, are they essentially the same thing? Thank you! I think that should work. Just be sure to coat in granulated sugar before placing in the mold. You answered every single question except mine. Thanks for being so welcoming. Won’t be coming back here, that’s for sure. Tried making them out of silicone lego ice cube trays…………the secret turned out to be enough granulated sugar! Couldn’t get out of the molds – more sugar – look great! Thanks for letting me know! Glad the sugar trick worked for you. I made these today to send to my friend who is turning 50. We used to make these when we were kids. I can’t wait for her to see them. I followed recipe exactly and they turned out perfectly! Thanks for the memories. Awesome, glad they turned out! What a nice gesture for your family! Do you recommend the normal liquid food coloring or the gel/paste food coloring? Thanks…gonna make for a bridal shower. Either will work. Just start out with a drop or two to begin with, and go from there.